We hope that your son will join us again for the Summer of 2012. This is the final day to guarantee that he can do that! We know that it is early, but once the deadline passes, we are going to open any available spots to our new campers on the wait list. In some age groups, we believe that there will not be any openings. Any new campers that have completed the Camper Application by the September 1st deadline will have first priority of the available slots. We have nearly 3 times as many registrations in today as we did at this point last year, and twice as many from new campers. ENROLLING NOW IS THE ONLY WAY GUARANTEE YOUR SPOT. Please don't wait! This is our way of protecting our returning campers. After September 1st may be too late in many age groups. We are looking forward to a fantastic Summer of 2012, our 68th camping season at North Star, and we hope that you will join us. We hope that all is well and that school is off to a great start. While the kids are busy starting homework and trying to enjoy the remainder of this summer season, we're working hard on the next one. We wanted to send you a quick reminder that this is your last week to guarantee a spot for your returning camper. We had a very young camp and we still have many, many prospects who are hoping to get a spot. Many of them are on our waiting list as are several campers hoping to switch to 8-weeks. That is why WE CAN ONLY GUARANTEE YOUR SPOT IF YOU ENROLL BY SEPTEMBER 1st. Please don't wait! This is our way of protecting our returning campers. After September 1st may be too late in many age groups. If you have a younger son that is interested in coming to camp next summer, please enroll him before September 1st as well. And if you have any friends or family that may be interested, please let them know that they should be in touch quickly. You can also fill out our Refer-A-Friend Form online. We are looking forward to a fantastic Summer of 2012, our 68th camping season at North Star, and we hope that your son will again join us. Around the Campfire is Coming! The Greatest Multi-Camp Reunion in History is Almost Here! In just two and a half weeks, we’re throwing a party. A big one. With more entertainment than the staff show. With more food than a cabin pizza party. And with more anticipation than the bus trip up to camp. We’ve put together a fundraiser for Camp For All Kids that combines the spirit of our former camp days with one great afternoon/evening of activities and socializing – all at one of the most beautiful day camp facilities on Chicago’s North Shore. And to cap off the day, the special evening entertainment will be a campfire concert by Noel Paul Stookey of Peter, Paul and Mary. Please join us on Saturday, September 10th from 1-8pm on the grounds of Banner Day Camp in Lake Forest, IL. We hope you and your family can attend. This year is Leb’s 40th anniversary at North Star. We would like to honor him with a big turnout and a big fundraising triumph. To reach our goals, we are asking your help to raise money so that we can assure the future of Camp For All Kids. Just a few minutes of your time right now can create life-changing camp scholarships for deserving boys and girls. We need to raise a lot of money. And the best way you can help is to create a personal fundraising page so your family and friends can donate to this life-changing organization. Just by creating your fundraising page and starting it off with a donation of $50.00, you can attend the entire event! 2. Click the blue "Join this Team" button (below the list of team members), complete the registration form and customize your fundraising page. 3. Make a contribution of $50.00 or more to YOUR fundraising page. 4. Send your fundraising page link to your family and friends. By setting up your personal fundraising page and emailing the link to your family and friends, we are confident you will raise a significant amount of money for Camp for All Kids. Or if you’d prefer only to make a generous contribution and/or attend the event, visit http://cfak.donorpages.com/AroundtheCampfire2011/NorthStarCamp and click the red “Donate Here” button on the right side. We hope to see you at the reunion. It’s a beautiful setting that can accommodate a variety of activities, rain or shine. Your participation means a lot to the next generation of campers. We look forward to hearing from you. Camp is now quiet. Well, almost quiet. It would be but for Leb performing his favorite annual cleanup task - Power Washing. But while he’s hard at work on the floor of the outer Lodge, the animals are moving back into camp and we have deer and wild turkey back on the Athletic Field. It is hard to believe that it has already been over a week since camp drew to a close. Since then we had a great Post Camp with families who joined us from around the country, some for the first time and some who have been coming for over 50 years. Six of our counselors (John Sheehan, Andy Rodheim, Scott Goldberg, Olly Cayless, Leighton Balemi and Lewis Mulvee) stayed on to lead post camp and help clean up camp, and we heard story after story of what a fun and meaningful summer it was for all involved. We have been hearing from campers and parents alike who are saying the same thing. That sentiment is being reflected in the enrollment for 2012. We have in more than twice as many registrations today as we did at this point last year, and we already have over a dozen people on a waiting list for second session. We want to reiterate that WE CAN ONLY GUARANTEE PLACEMENT FOR RETURNING CAMPERS IF YOU ENROLL BY SEPTEMBER 1st. Please don’t wait! This is our way of protecting our returning campers. After September 1st may be too late in many age groups. If you have a younger son that is interested in coming to camp next summer, please enroll him before September 1st as well. And if you have any friends or family that may be interested, please let them know that they should be in touch quickly. You can also fill out our Refer-A-Friend Form online. We have a special request for you in honor of Leb’s 40th year at North Star. Do you remember Request Night, the last night of camp at North Star? This annual gathering at Mike Hall sums up the experiences of the summer and helps everyone reflect on the true meaning of camp. Campers realize and appreciate how camp has impacted them through friendships and teamwork, skill development and personal achievement. Regardless of where campers come from, North Star works hard to teach these positive and lasting qualities. As you know, Lou and Renee started this important tradition. Leb and Sue continued it. And now you may have heard that Andy and Vickie Shlensky will ultimately become the new directors of North Star and protectors of these life-changing values and traditions. For a certain group of campers, camp means hope for a brighter future. Leb and Sue have been tremendous supporters of the Camp For All Kids program, allowing boys from diverse backgrounds to come to North Star and experience something special that is missing from their lives. For many, they gain abilities that they could take home with them and apply as future leaders of their generation. When camp is diverse, everyone benefits. In today’s world, the camp experience shouldn’t be limited to a select group of affluent children. We have the ability to create a positive influence for kids of diverse backgrounds through Camp For All Kids. As long as the Camp For All Kids program is funded, selected campers can choose to return to camp year after year, just like their other friends. In honor of Leb and Sue, we are asking your help to raise money so that we can assure the future of this high-impact program. We want your immediate help to start your personal fundraising page and help us raise money for the Camp For All Kids benefit in Lake Forest, Illinois on Saturday, September 10th. The event will feature a concert by Paul Stookey of Peter, Paul and Mary. 4. Send your fundraising page link to your family and friends. By setting up your personal fundraising page and emailing the link to your family and friends, you will help raise a significant amount of money for the Camp for All Kids. 5. By creating your fundraising page, you can attend "Around the Campfire" on September 10, 2011 for FREE! It’s really easy. In just 15 minutes, your effort can bring a powerful camp experience to kids from under-served communities. As the torch gets passed at North Star, nothing would make Leb and Sue happier than to help provide these deserving kids the same camp experience we all shared. With your generous contribution, Camp For All Kids allows a brighter future to happen. P.S. The event is right around the corner. We hope to see you at Banner Day Camp on September 10! We're still busy at camp and have 90 post campers enjoying perfect summer weather. It is so much fun to watch families enjoy the Northwoods. We've got one more camping adventure planned for this summer. In the spring I wrote to you explaining that we were organizing an event entitled "Around the Campfire" to be held at Banner Day Camp in Lake Forest, IL, north of Chicago on September 10, 2011 (09/10/11). The goal of the program is twofold. - To have a fun, exciting day program for alumni and campers, followed by a BBQ dinner and an early evening concert by Paul Stookey of Peter, Paul and Mary. - To raise funds for the Camp for All Kids (CFAK) Foundation. 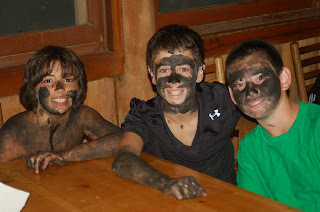 This foundation sends minority campers to camp. We had hoped that the majority of our campers would get involved and help raise funds for CFAK. In fact, some of our campers created websites at camp and have begun raising money. I believe the events at Banner will be a lot of fun and that anyone who attends will have a great time. Alumni from the 50's and campers from 2011 will have fun! We've made it easy for (camper's name) and you to attend. You can attend for a nominal contribution to CFAK. All you need to do is for you or your son to join the North Star team at http://cfak.donorpages.com/AroundtheCampfire2011/NorthStarCamp, create your own team and make a suggested contribution of $50.00. Then send the link to your family and friends. We know that if this is done, your team will help raise a significant amount of money for the Camp For All Kids Foundation. And you can attend "Around the Campfire" for free. The dust has now settled on the Summer of 2011, and we can conclusively say that it was a great one. We have been hearing tons of positive feedback from the campers and their families and the Applications for 2012 are already flooding in. We cannot thank our campers, families and staff enough for all that they do to ensure that North Star continues to be a special place for kids to call home each summer. So as we start to reflect on the Summer of 2011, we first want to say thank you! If you look to the right, you'll see that the Countdown has already begun to the Summer of 2012. Thanks to the continuing enthusiasm of our staff and campers, we know that it will be a great one. As school starts and you find yourself daydreaming about camp, we hope that you will keep us up to date on all of your endeavors. We are so proud of all of the things our guys accomplish in their hometowns, and we love to brag about you. Any time you think of it, don't forget to Send Us Your News. And we'll see you in 2012! Lazy Day...More Like Crazy Day! It may have started as Lazy Day, but it didn't finish that way! Lazy Day is a chance to catch up on some Zzz's and spend the morning living like a prince. After waking up at their leisure, the campers walk up to the Lodge in their pajamas or bathrobes and can have made-to-order eggs for breakfast while watching cartoons. Now that's hard to beat! From there we were off to the races on a day that included an organized free period, North Star Ball, Casino Night, the Art Show, and Espionage. North Star Ball is like capture the flag, but instead of one flag on each end, the Green and White teams were working to get four balls on their side all at the same time. Unlike the flag, you can actually pass the balls between teammates as long as it doesn't hit the ground. This was our final Green-White event of the summer and we will unveil the scores on Thursday at the Council Ring. After dinner North Star turned into the Bellagio, with a Casino on one end and a world-class art gallery on the other. In the lodge our costumed crusaders wagered on everything from euchre to war to horsengoggles. Down in the Arm and Hammer, our sophisticated crowd mused through the fantastic works made by our campers throughout the summer. 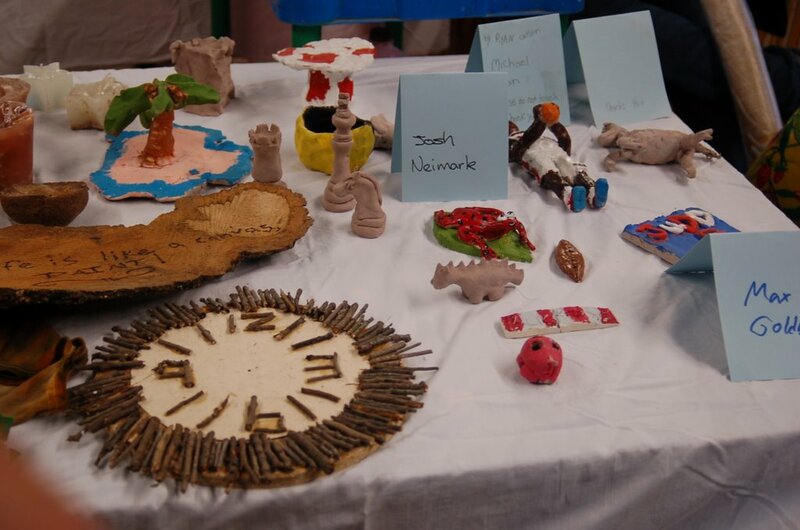 We were so impressed with the hard work and talent of our artists this summer as everyone looked at their wood clocks and stepstools, mosaic tiles, candles, piggy banks, tye-dye t-shirt pillows and more. It was quite an impressive display. And after evening program came the moment that the campers had been waiting for - Espionage! The boys got dressed up in their blacks and greens to do their best to blend into the darkness. After sundown at the North Star casino, we began the second session Espionage, themed "Ocean's 11." The mission was to break into the "vaults" located around camp. Hotel security was wandering around camp checking identification to make sure that only the welcomed guests were around. The game was a new format developed by our staff members Jared, Oliver, Willy and Harry, and it was a huge success. What a day! Pow Wow Day and the Big 10! We woke up to a beautiful Northwoods morning with the hot sun burning the mist and dew off of the fields. It had the makings of a great Pow Wow Day right from the start, and it was. The entire camp was divided into four tribes - Apache, Hunkpapa, Mohawak and Sauk Fox - for a day of spirited competition. After breakfast, we had our traditional Pow Wow day ceremony where the whole camp marches down Villa Road onto the athletic field following Leb on horeseback. After that the tribes separated by village for leg wrestling. Each village narrowed down to a final four and eventually a winning leg wrestler. There are always twists and turns during the leg-wrestling competitions, and this year was no exception. After leg wrestling, we had two morning series of events. One of things that makes Pow Wow Day so special is the diversity of the events. There are plenty of sports as well as events like climbing and archery, however there are other specialty events that really give all of our campers an opportunity to excel. Campers compete in events like orienteering, scavenger hunt, not to mention several Arts and Crafts and canoeing events. Our campers have so many talents and it's neat to see them all on display. Lunch on Pow Wow day is a unique meal as well. Unlike our typical meals where the dining hall is filled with enthusiasm and cheers, this meal is silent, and campers and staff have to figure out how to communicate for the entire meal without talking. Though the meal itself was silent, the sky was not. While we were at lunch, the clouds opened up it began to pour. So we adjusted our plans for the afternoon and Dan and the advisors planned a great program of indoor competitions that included paper football, a spelling bee, card games and more. The advisors also took part in a bingo showdown to determine the eating order for dinner. Mid-afternoon the sun returned and so did our regularly scheduled activities. We started off with run-offs and the tug of wars, and after dinner we were able to get in all of our swimming events and water polo. Upon the conclusion of all the activities, the whole camp made their way up to Mike Hall where they were awaiting the results of the day. But before that could happen, Leb was interrupted by the Big 10! Each year, we take the opportunity to recognize the people who have given a whole decade's worth of summers to North Star. This year we celebrated the accomplishments of three great counselors - Scott Goldberg, Craig Morelli and Michael Skaletsky - who are all at camp for their 10th summer. We told some great stories about the guys and then made our way to the Lodge for cake. Oh yeah, and we did announce the scores after all. But as the guys like to cheer here, "It Just Doesn't Matter!" It was a great day for all of the campers and staff! One of my favorite nights of the summer is when Sue and I host the 2nd generation party at our house. At the conclusion of this evening's Friday night service we had 40 kids over for ice cream sundaes. The kids represented hundreds of years at North Star. Even more impressive was the 3rd generation campers and 1 4th generation camper. These guys had grandfathers that camped at North Star! It's really fun as the kids never tire of hearing stories about their dads. And do I have the stories!! Tradition is huge around camp and there are so many symbolic programs that carry on from one generation to the next. For example, when kids go home and tell their dad (or grandfather) that they threw a key log into the fire on Friday night each generation will know exactly what is going on at camp. Talk about UN Day, Wanagan, Pow Wow Day, Challenge Games, camper counselor day, cruiser days, half-hour later, lazy day, the Guten Gallop, Bi-camp meet, organized free periods, save your forks, one day projects, etc, etc, etc and generations can talk together for, well... generations. And that’s one of the beauties of camp. It’s timeless. Sue and I are committed to insuring that future generations will have the opportunity to talk about North Star. The campers were told tonight that Andy Shlensky was being named co-director. It's no secret that since Andy was 12 years old and a camper at North Star that he had the goal of directing a summer camp. His preference was always North Star. We began talking about making that a reality when he began working for us several years ago. He has been the primary contact for the majority of our new campers and has communicated with most of you over the past year. He will continue assuming more and more responsibility. At this moment no formal discussions have taken place regarding a transfer of ownership. They will begin in the near future. So, why are we telling you this now? It's consistent with our policy of always letting you know when important issues are taking place at North Star. And naming Andy co-director with the intention of having he and his wife Vickie responsible for future generations is an important issue! Without question, Sue and I will be at camp for the foreseeable future. It is probable that I will spend more time on the athletic fields teaching baseball, football and golf. I might even have time to pull out the guitar and rock and roll on the porch with the kids. I will, of course, continue to cut the grass on the riding mower. Sue will continue to inspect cabins, monitor cabin meetings, supervise the health center and kitchen, expand the camp garden and be resident mom to all the kids. You've got it correct. Sue will be as busy as ever and "Old Man Lebby" will be playing with the kids. Sounds like a great deal to me! As I was writing this letter a young woman who was vacationing in the area came into the office. She said that she had a strange request. She explained that she just started a new job and her boss was a camper at North Star in the 70's and 80's. She wanted to buy a tee shirt or something to give to him. I asked her bosses name. She was amazed when I told her that I not only knew her boss, where he grew up but I also knew his brother and parents as well. I also explained that he started our rocketry program and that he was editor in chief of our camp newspaper, The Siren. I showed off pictures of her very young boss at camp. On a regular basis Sue and I are reminded of the wonderful community that was created by Lou and Renee Rosenblum in 1945 and we have always been conscious of the need to protect the legacy that is represented in the North Star name. Andy gets it as well. I'm excited to continue my rein as "Old Man Lebby" and I’m looking forward to telling more stories to future generations of campers. I'm even more excited for the future of North Star! We truly cannot say enough about the energy of our staff, and today was just another great example. For the yesterday's Cruiser Day, the staff organized "Middle Ages Day" (pun intended) for our Intermediate Village. From the limitless brain of Village Director Ben Mizel came a day of events full of imagination, creativity and fun. The village was divided into 6 teams - Vandals, Normans, Saxons, Franks, Vikings and Visigoths - and they each actually learned what that meant! They kicked off the festivities with a double-elimination Braveheart tournament. Braveheart is a game where you lock hands and use your pointer-finger as your "sword." The first person to make contact with the other person wins the duel. Then the teams proceeded to the theatrical portion of the day, which involved the jesters presenting their team's flag, a ballad and a dance. All of this was judged by our damsels in distress! From there it was onto a quest for the Holy Grail, which was a detailed scavenger hunt that even included a William Tell archery shoot.. . sort of. They did shoot at an apple, but not off the top of anyone's head! Last, but surely not least, was The Seige! 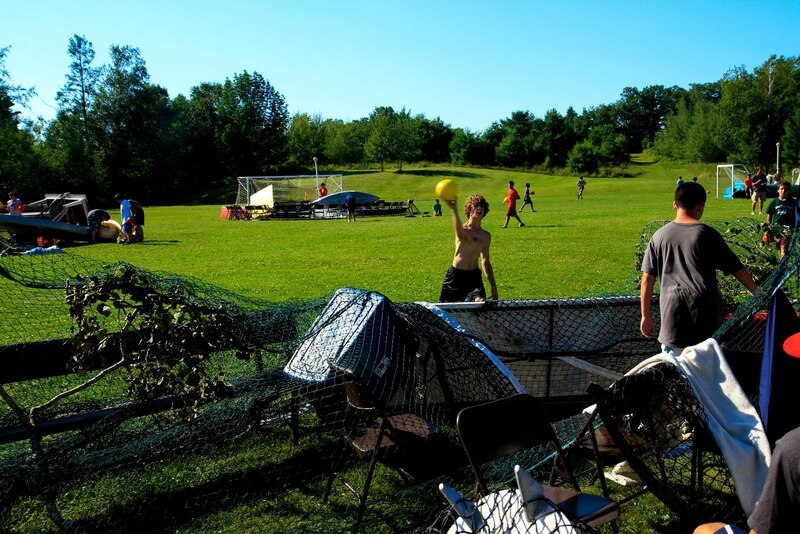 The teams had spent parts of the whole day building forts on the middle of the athletic field. They used everything that wasn't nailed down. Canoes, tables, tennis nets, soccer goals, chairs, and more. The only criteria was that each fort had a "mast" on which you could balance a ball. The other teams would then try to knock of that ball with dodgeballs of their own. There really is no way to describe it other than organized chaos. They had a day for the (middle) ages! Sunday was a big day here in the Northwoods. Not only was it the conclusion of the Lumberjack World Championships in Hayward, where Jason Wynyard took home another title, but it was also the Green-White Egg Marathon and Elections to choose the President and Vice President of the Great and Glorious North Star Party! This weekend was also the second of our Rookie Weekends, and we are very thankful to the many guests who made the trip up to camp to see what North Star is all about. An event like no other, the Green-White Egg Marathon is a relay race around camp comprising of every imaginable camp activity. After each team completed over 40 events a piece, they tagged their last two teammates who were chosen to build the fire for "Boil Water Boil," a race to see which team can get their Number 10 tin can to boil over first. To complicate matters, each team must carry a raw egg with them throughout the entirety of the race. Whether they are shooting archery or climbing to the top of the wall, they must do so with the egg carefully stowed. At several check points, the teams had to prove to the judges that their egg was in fact intact. If the egg was cracked, a member of the team had to return to the porch of the office to collect a healthy egg. The egg's final destination was in the Number 10 tin can of Boil Water Boil, and the victorious White Team feasted on their hard boiled egg after the conclusion of their fire. It was a tight race with several lead changes and two great fires at the conclusion. Every year at camp, we let politics creep into camp to elect a President and Vice-President of the Great and Glorious North Star Party! Unlike real politics, things here remain quite civil and we don't have to worry about the Camp Council's debt ceiling. Instead we worry about very pressing issues such as the cereal selection on the breakfast bar to exploring teleportation as an option to make the camp program more efficient. The candidates are vying for these positions so that they can represent the camper base at staff meetings, and most importantly switch places with Leb and Dan respectively on Camper Counselor Switch Day coming up in the last week of camp. Candidates from our young Juniors to our Pine Manor campers went cabin to cabin campaigning, put up signs around camp, and even petitioned for their spots on the ballot. When all was said and done, the Pine Manor tandem of Lucas K. and Andrew R. emerged victorious and will represent the camper base going forward during their term. In other news, our Pine Manor campers headed out on Saturday Night to catch a night's worth of action at the Lumberjack World Championships. The boys got to meet Jason and Karmyn Wynyward, the King and Queen of the Lumberjacking World. The couple from New Zealand has consistently dominated the competition, and Jason made an appearance at North Star in 2009 when he gave a tutorial on sawing and chopping. The North Star crowd has consistently made up a loud cheering section for Jason and he came over to greet his fans afterward. The boys had a blast. In addition to these major events, we have a tone more coming. We are making preparations for Pow Wow Day, the Guten Gallop, Espionage, North Star Ball, Glen's Game, Predator and Prey, the Dodgeball Extravaganza, Casino Night, Camper Counselor Switch Day and more. We're over half way through our second session, yet we still have so much to do! We've had a great session thus far with so many new, young campers settling in and making friends, and learning to call North Star their second home.